It's time for another Sweet Sunday Sketch Challenge! Here is the deal: make a card with this layout and use the InLinkz button down at the very end of this post to enter your card. The links will close in two weeks, next Friday at 10 PM (Mountain Time). Be sure to link directly to the blog post or gallery image which features your card. You may post a picture of the sketch on your blog, but please save the image to your computer first. Use the keyword SSSC178 if you plan to post your card in an online gallery. 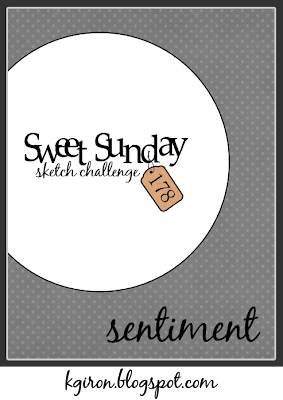 I will be announcing the next Guest Sweet Sunday Stamper later this week, so be sure to check back to see if you will be joining the design team for SSSC179! I didn't have a chance to ink up this sweet little Pure Innocence Bunny Ears during Teaser week, so I was itching to stamp with her yesterday. The card base is Sweet Tooth Card Stock and I used some foam tape to pop up another layer of Sweet Tooth over the base. I really love the crisp look this gives a card - do you? I stamped this sweet girl in Memento Tuxedo Black ink on X-Press It Blending Card Stock and then colored her with Copic Markers. I used a piece of Collectable-Memorable 6x6 paper from My Mind's Eye, which I cut out with a Circle STAX Die-namics. I kept this one pretty plain and simple. Adorable, Karen! Brilliant sketch too! Oh she's so cute, Karen!!! Love this CAS layout! Love this so much Karen!! I do love the white base and layer of white! Your coloring on that sweet image is awesome, the egg looks amazing!!!! This is super sweet Karen!! I love her little pink outfit with the teal egg and the polka dots behind her are perfect! This is adorable, Karen. Love how the little girl looks against the dotted background. LOVE the crisp look! Darling, Karen!! I was dying to see what you'd create with this sketch. And I knew you would blow it out of the water. This is too freakin' cute Karen. I love, love, love how you colored this cutie!!! instead of clean and simple! 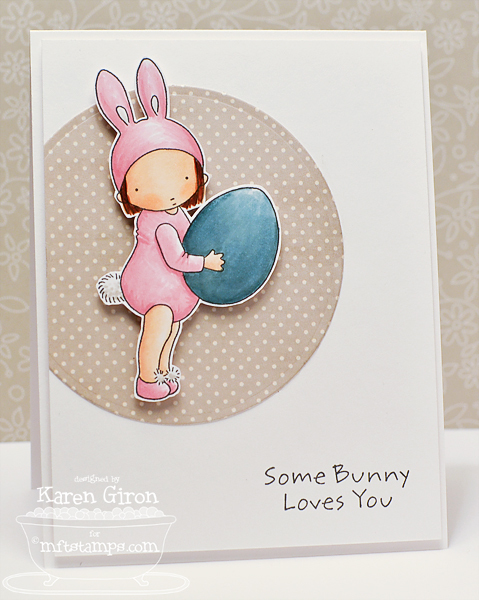 Your card is so sweet and I love the shading on her little outfit - you have all the creases in just the right spots! Your card is adorable, Karen! Thanks for another fun sketch to work with! I enjoyed playing along again this time! Super cute Karen! Excellent job on coloring this adorable image! Great sketch. Love your CAS card! Love the big circle element on the sketch!